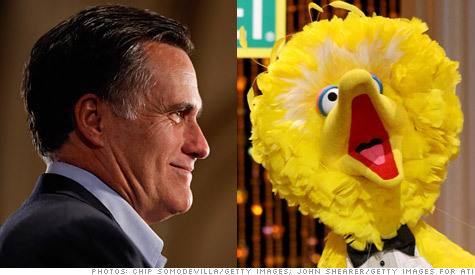 NEW YORK (CNNMoney) -- What, exactly, does Mitt Romney have against Big Bird? Well, he doesn't want the feathered 8-foot-tall bird on the federal dole. At least not when he's president. Romney, the 2012 Republican candidate and former governor of Massachusetts, has taken aim at the legendary entertainer in recent days, saying Monday that federal funding for PBS should be eliminated. "Maybe Big Bird is going to have to have advertisers," Romney said. Romney is not just after Big Bird and friends. He has proposed eliminating all federal funding for PBS, the National Endowment for the Arts and the National Endowment for the Humanities. "They all get money from government," Romney said. "They are going to have to stand on their own." Romney said the programs are examples of wasteful government spending -- and don't pass his funding litmus test. "I'm going to take all the programs," Romney said in Des Moines. "And look at how much money is associated with each one, and ask this question: Is this program so critical to America that it makes sense to borrow money from China to pay for it?" What Romney hasn't been saying is exactly how much cutting those particular programs would save. The answer? Not very much. Stripping all federal funding for the Corporation for Public Broadcasting -- which helps fund PBS -- would save around $450 million a year. That's $450 million with an "m," not a "b" -- and it pales in comparison to the roughly $3.5 trillion the government will spend this year. And not much of that makes it to Big Bird. Sesame Workshop, which produces "Sesame Street," says on their website that 93% of production costs for the show are covered by licensing activities or corporate sponsorships. Funding for the National Endowment for the Arts sits at around $170 million, a number the Obama Administration has already proposed reducing by 12%. Of course, every little bit counts when it comes to unsustainable long-term budgets, and Romney has also proposed cutting the size of the federal workforce, changing Medicaid to a block grant program and capping spending at 20% of gross domestic product, an aggressive goal in the near-term. But like any chief executive, Romney must face another reality: Congress, not the president, controls the nation's purse strings. To illustrate how difficult budget changes can be, just take a look at what happened last time Republicans picked a fight with the oversized canary. Last year, Big Bird survived a brush with budget-cut-hungry Republicans in the House, who voted to cut funding for the Corporation for Public Broadcasting, only to see it added back in to the final government funding deal. The funding extension came as a relief to public broadcasting advocates, who argue that a reduction in federal funding would make it difficult for rural stations to stay on the air.